We had hoped to hold Sunday's free guided nature walk at Losen Slote Park, but the park is muddy and more rain is expected this weekend. As a result, we are switching to the walk to DeKorte Park in Lyndhurst — 10 a.m. The Birding for Beginners class meets at DeKorte at 1 p.m. the same day. Here's the listing for the walk. Sunday, April 3, 10 a.m. This free two-hour guided nature walk starts outside the Meadowlands Environment Center in DeKorte Park in Lyndhurst, and runs from 10 a.m. We’ll walk around the square-mile-park, looking for spring arrivals, Bald Eagles and other birds. 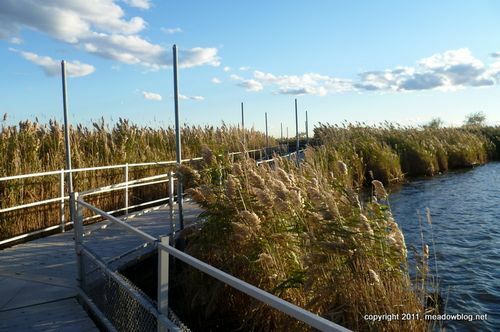 The walk is run by the N.J. Meadowlands Commission and the Bergen County Audubon Society. Check meadowblog.net for last-minute weather updates. You will have to sign a standard liability release for this event. To rsvp, contact Don Torino of the BCAS at greatauk4@aol.com or 201-636-4022.